The Umpqua river offers excellent salmon and steelhead fishing almost year round with runs of Spring chinook from late March into July, peaking in April and May. The the fall chinook start moving into the Umpqua river in August and September. Hatchery fall coho are planted in the South Fork and move through the mainstem quickly after the first fall rains. Both winter and summer steelhead fishing are good as well, with summer steelhead peaking in June and July on their way to the North Umpqua. The larger winter run may on occasion include a fishery for wild steelhead, and hatchery fish on their way to the South Umpqua are usually in good numbers as well. Also the steelhead fishing from December into March is good as well. 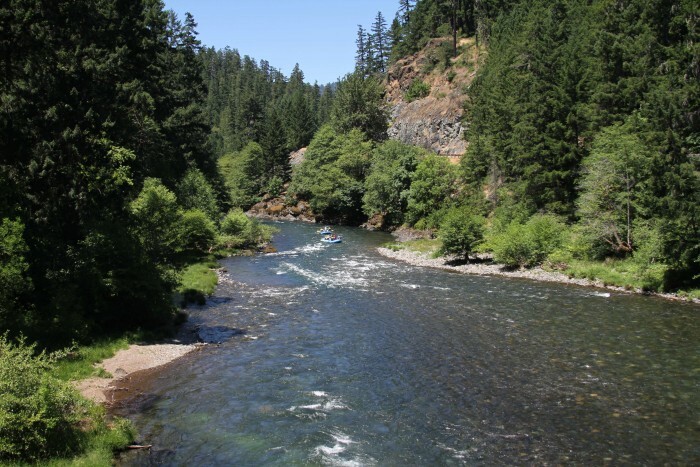 The North Fork of the Umpqua is most recognized for its healthy runs of wild and hatchery summer steelhead, the North Umpqua is also fished for wild winter steelhead, spring chinook and fin-clipped coho, and offers fine trout fishing above Soda Springs Reservoir. A mix of hatchery and wild summer steelhead enters the North Umpqua in June, with catches high in July and August and again in October and November after the water cools. The river’s winter run gets going well in January but these days is primarily wild fish. Spring chinook are present from April through October, with peak catches in May through July. The Umpqua River offers fishing opportunities year round with both Summer and Winter run Steelhead and Summer and Fall Salmon fishing.